On October 6th, 2013, the Catalina Sky Survey discovered a small asteroid which was later designated as 2013 TX68. As part Apollo group this 30 meter (100 ft) rock is one of many Near-Earth Objects (NEOs) that periodically crosses Earth’s orbit and passes close to our planet. A few years ago, it did just that, flying by our planet at a safe distance of about 2 million km (1.3 million miles). And according to NASA’s Center for NEO Studies (CNEOS) at the Jet Propulsion Laboratory, it will be passing us again in a few weeks time, specifically between March 2nd and 6th. Of course, asteroids pass Earth by on a regular basis, and there is very rarely any cause for alarm. However, there is some anxiety about 2013 TX68’s latest flyby, mainly because its distance could be subject to some serious variation. 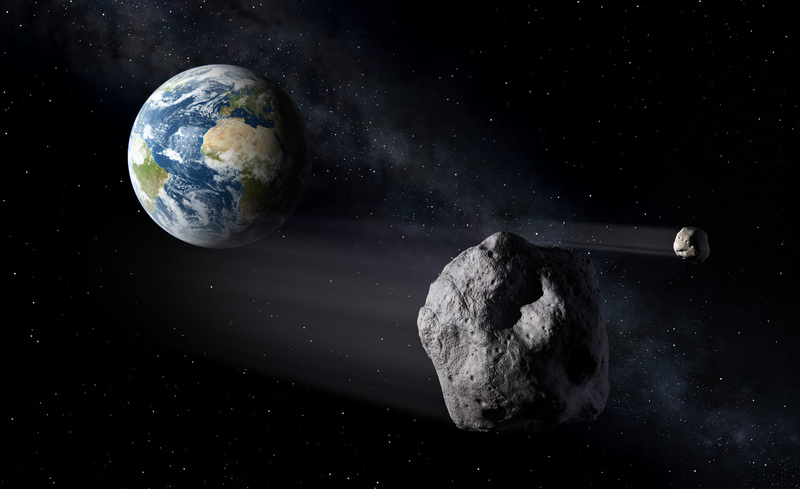 Basically, the asteroid is expected to make its closest approach on March 5th, and will pass Earth at a distance of between 14 million km (9 million) and 17,000 km (11,000 miles). By comparison, the Earth’s Moon lies at an average distance of 384,399 km (238,854 miles) from Earth, ranging from about 362,600 km (225,309 mi) at perigee to 405,400 km (251,904 mi) at apogee. This means that there is a chance that, between March 2nd and 6th, this small asteroid will get far closer to Earth than the Moon ever does. The reason for this variation in estimates has to do with the trajectory of the asteroid, which scientists cannot entirely predict. This in turn is due to the fact that they have only been able to track it since its discovery, just three years ago. But before anyone starts contemplating building bomb shelters in their backyard and stocking up on dry goods and bottled water, there are few things that need to be clarified. For one, scientists at CNEOS have determined that there is NO CHANCE the asteroid will impact on the Earth on this pass. And while NASA has identified an extremely remote possibility that 2013 TX68 could impact Earth when it passes us again on Sep. 28th, 2017, the odds of that actually happening are no more than 1-in-250-million. To top it off, the asteroid will be making flybys again in 2046 and 2097, and in both cases the odds of an impact are even lower. In addition, in the unlikely event that the asteroid does hit Earth, it is too small to cause any significant damage. Consider the asteroid that broke up in the atmosphere over the Russian town of Chelyabinsk in 2013. That asteroid measured roughly 20 meters across (65 feet), and caused significant property damage and over 1500 injuries. However, this damage was limited to the effects of the sonic boom caused by its explosion in the atmosphere. What’s more, much of the damage caused by the Chelyabink asteroid was due to the fact that it was undetected before its atmospheric entry – in part because its radiant was close to the Sun. As such, much the harm it caused was the result of panic and the townspeople being unprepared. At roughly 30 meters (100 feet) in diameter, 2013 TX68 would likely produce an air burst with about twice the energy of the Chelyabink asteroid. However, since scientists are actively monitoring this and other NEOs, the odds of it exploding above a community without warning are even worse than it actually entering our atmosphere. Above all, we should remind ourselves that Near-Earth Asteroids pass by Earth all the time and cause no damage. In fact, NASA’s Near Earth Object Program (NEOP) indicated that in 2016 alone, NEO’s have passed Earth on ten occasions. What’s more, the JPL’s Asteroid Watch program has listed the next five approaches that will take place in February, and has concluded that these will all take place at distances of between 7,338,608 km (4,560,000 mi) and 151,440 km (94,100 mi). And before 2016 is out, NEOP anticipates that NEOS will make another 80 passes of Earth. In the vast majority of these cases, the asteroids will be well outside of the Moon’s orbit. Of course, if you still feel concerned, you can always check Asteroid Watch’s Twitter account for news and updates on the possible approach of asteroids. In the meantime, rest easy. We’re not due for Armageddon or an Extinction Level Event anytime soon! The asteroid only has a short and insignificant 3 day observation arc which makes long-term predictions of its position less certain. It has not been observed since 2013-Oct-09. While the trajectory of the Chelyabinsk meteorite may have been “close to the Sun”, wouldn’t this only have hampered its detection within a few days of its arrival? It seems to me the primary detection failure occurred much earlier.